I love having long, healthy hair- but that means I have to take extra good care of it! I have tried many, many hair products over the years, from all different price points, and these are a few of my absolute must-haves. I also have favorite special products like masks & treatments, as well as products that I use to achieve certain styles (curls, waves, ponytails, etc.). Let me know if you want to see more specific favorites, but for now- here are some of my everyday basic products that I never go without! 1. Carol's Daughter Monoi Repairing Shampoo & Conditioner: These are two different products, but I am combining them as one since they go together! I love the island coconut smell of these products. I also love how soft they make my hair. They are both formulated free of parabens, sulfates, phthalates, petroleum, and mineral oil. My hair feels really strong & hydrated after using these. I also use a penny-sized amount of the conditioner on damp hair as a "leave-in" treatment. 3. CHI 44 Iron Guard: I have been using the same bottle of this so long, so it definitely goes a long way. I spray this on dry hair before curling or straightening. It has a nice light scent & doesn't weigh down my hair at all. I have another go-to heat protectant product I use when curling, but I would choose this if I could only have one! 5. Biosilk Silk Therapy: This is another product where a little bit goes a very VERY long way; I have had the same bottle for years. As the very last step in my hair routine, I apply a very small amount to my fingers (somewhere between a pea & a dime- depends on how much hair you have!) & run it through the ends of my hair & over any fly-aways. It seals and nourishes the ends of my hair, & keeps it looking soft & shiny all day long. I also apply this between washes to keep my ends hydrated. I feel like my hair is more frizzy & dry when I don't use this. 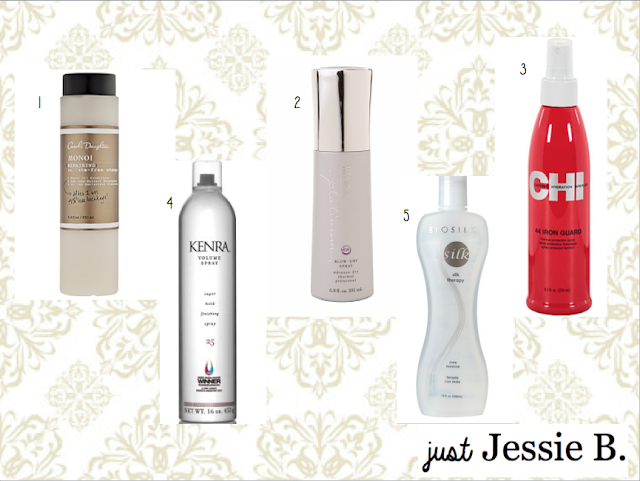 & If you do try any of these products I've recommended, let me know what you think of them! Thank you for all of the time and effort you put into this post to help others. I have been using this hair care product for years and it's good. Thank you so much for this wonderful post really! hair care products I think this is the right place for me!